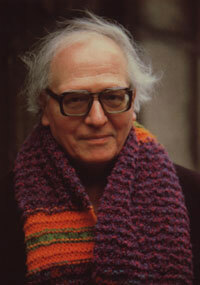 Olivier Messiaen was born on 10th December 1908. He is a pivotal figure in 20th century music. While Dmitri Shostakovich and Malcolm Arnold took an existing musical language to its ultimate expression, Messiaen created a totally new soundscape. Here, to celebrate his birthday, is an article I wrote in May this year. Life today is all about boxes. Our working life is controlled by email inboxes and outboxes, commercial success is measured at the box office, entertainment is delivered by Xboxes, and we even get our contemporary music fix from NewMusicBox. 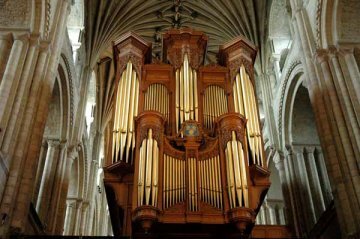 But today’s superb performance of Olivier Messiaen’s L’Ascension by Julian Thomas on the organ of Norwich Cathedral reminded me of the importance of thinking outside the box. L’Ascension is an early work by Messiaen (below) which was originally composed for orchestra as four symphonic meditations. The organ version has a different third movement to the orchestral version, and was first performed in 1936. The four movement twenty-five minute work has many of Messiaen’s signature ‘outside the box’ features including unusually slow and sustained tempi for the first and final meditations, and the use of highly chromatic harmony throughout. In the final meditation, which is inspired by verses from St John’s Gospel, the quiet, floating melody, harmonised in parallel, ascended slowly to the great Perpendicular roof of Norwich Cathedral like a prayer. Box-like is the last description that could be applied to Norwich's awe-inspiring Anglican Cathedral. It was built by the Benedictines to a Norman ground plan, and was consecrated in 1278, but the magnificent roof and 315’ high spire date from 1463 when they were rebuilt after a lightning strike destroyed the originals. The earliest reference to an organ in the cathedral dates from the 14th century, and a succession of new organs were built, and later destroyed, either by fire or deliberately through the centuries. The present organ (photo above) was constructed in 1899 by Hill, Norman and Beard and extensively rebuilt following a fire in 1938, and is eminently suited to Messiaen’s rich textures. Messiaen's complete organ works, including L'Ascension, are available in a highly recommended 6 CD budget priced set on Regis (RRC6001). 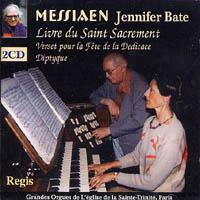 Jennifer Bate plays the organs of Beauvais Cathedral and L'église Sainte Trinité in Paris, and the recordings were made in the presence of the composer. That mention of Beauvais Cathedral provides a fascinating coda to this overgrown path. Thinking outside the box means experimenting, and experiments sometimes end in failure. This is well-illustrated by the Cathedral of St Pierre in Beauvais. This cathedral, which is in some respects the most daring achievement of Gothic architecture, consists only of a transept and choir with apse. The vaulting in the interior exceeds 150 feet in height. There is no nave, and the small Romanesque church of the 10th century known as the Basse Oeuvre occupies the site destined for the nave. 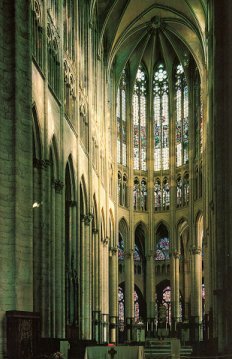 Begun in 1247, just thirty-one years before Norwich Cathedral was consecrated , the masons of Beauvais aimed outside the box by adding an extra 16 feet to the height, to make it the tallest cathedral in Europe. But the experiment failed, and work was interrupted in 1284 by the collapse of the vaulting of the choir (left), a disaster that produced a temporary failure of nerve among the artisans. In 1573 more thinking outside the box resulted in the fall of a too-ambitious central tower. Work stopped again, and little further building, other than repairs, was carried out. If all the people in the world looked in one direction only, this would have serious consequences on how mankind perceives itself. It is important that some people look around in all directions in order to describe what they see to others. * The Messiaen performance by Julian Thomas, who is Norwich Cathedral's assistant organist, was a fund-raiser for the Cathedral Choir's US tour in October. The Cathedral Choir consists of sixteen boys (aged 8-13), all of whom attend Norwich School, and twelve men, six of whom are choral scholars. It sings regularly at six choral services a week during term and also at many of the special services held in the Cathedral – especially during Holy Week, Easter and Christmas. The choir's repertoire includes music by all the great English composers of the last five hundred years and also many works by continental composers from Josquin to Messiaen. The choir has given premières of music by many contemporary composers including Giles Swayne, John Tavener, Paul Patterson, Arvo Pärt (right -whose I am the true vine was a 1996 commission for the choir to celebrate the 900th anniversary of Norwich Cathedral), James Macmillan and Diana Burrell. The choir has toured Europe and the United States, broadcasts regularly on the BBC and features on numerous recordings. * Churches comprising a choir and a transept without the nave make famously good recording venues. The remarkable acoustics of Merton College Chapel, Oxford, which is frequently used for recordings, are put down to the absence of a nave in this large building. * Another remarkable church today compring a nave and chancel only is Dore Abbey on the Welsh borders which I mentioned, appropriately, in Wot no computers. Although Dore Abbey is used for occassional concerts its blissfully remote location means it is not used as a recording venue. A new organ (albeit not a pipe one) has just been installed in the Abbey, follow this link for more details and some wonderful photos. Can anyone explain how this story has ended up going round the world on a newsfeed for NEWFOUNDLAND? And a link worth following to a blog worth bookmarking.